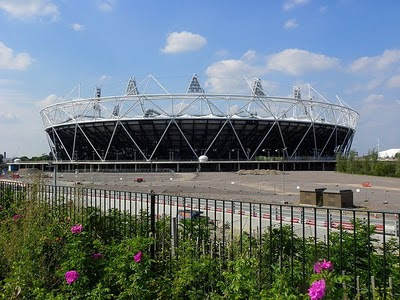 More evidence of the true face of the Olympic "sporting legacy", as Newham council has announced that it plans to shut down the Atherton Leisure Centre in Stratford on December 31st 2011. In a statement on the council's website, it says that the closure is the result of "spiralling costs for the repair of the ceiling over the centre's main pool and an estimated maintenance requirement of more than £2.2 million over the next ten years". Mayor Sir Robin Wales insists that the council is committed "to providing a new facility with a pool as quickly as possible and we want people to have a say in what else might go in it", adding:. "We would like to have kept the centre open while we look at all the options but we simply cannot afford to do that. It would be foolish and a complete waste of money. We need to replace the leisure facility. Doing repairs is money down the drain." However, minutes of a council meeting on 22 September [PDF] make clear that "at present there is no identified capital funding for the new facility [to replace the Atherton Centre], and no external investment has been secured". It adds that "here is significant risk that the capital financing will not be secured for a replacement facility". Council officers also acknowledge that there is insufficient capacity within other facilities in the borough to cope with the closure of the Atherton Centre - there will be severe problems in accommodating the School Swimming Lesson Programme that currently uses the Atherton pool to full capacity, as well as 81 private swimming lessons and aerobics classes, fitness sessions and football clubs. The Atherton Centre has approximately 240 000 visits a year, 23% of the borough total visits to Leisure Centres. Its loss, with no concrete plans for a replacement, will have a significant impact on leisure facilities locally and it will cost local taxpayers £80,000 to decommission the building. The planned closure also seems to have been in part influenced by the end of the current contract with Greenwich Leisure Ltd, who currently tun the centre. Meanwhile, the planned opening of the Olympic Pool to the public is not due to take place until 2014. So what happens over the next two years? Tomorrow , a protest is planned to show the council that local people are not prepared to accept the closure of a popular community resource. Meet outside the Atherton Centre (189 Romford Road) at 11am. LAZY FRIDAY - What If Computer Problems Were Real? What if computer problems were real? This week's Friday lunchtime distraction is for everyone having a really bad day at the office. Many thanks to Pete from local community radio station NuSound for letting me know that for next year's London Olympics, official sponsor Coca-Cola is recruiting people "to help distribute drinks to athletes, visitors, staff and volunteers within the Olympic Park and other London 2012 venue" - but isn't paying them. The posts of 'Venue Operator Interns' will involve, amongst other tasks, the distribution and arrangement of "up to an average of 80 cases of product per day", as well as ensuring "the correct amounts of stock are maintained and recorded". Internships are full time for a period of 4 to 8 weeks between 18 July and 12 September next year and their hours may include late night shifts. The work is evidently demanding: applicants are expected to be "physically fit with a high level of energy". So much of been made about the employment opportunities that the Games will bring to local people, although there are only 11 jobs in east London listed (as of today) on the official Jobs for the Games website. But it's still a shock to discover that a 'Worldwide Olympic Partner' like Coca Cola has found a way around minimum wage legislation by not paying interns a wage at all - especially when even the Department for Business Innovation and Skills has produced guidance advising that intern positions should be paid the National Minimum Wage. Unsurprisingly, the offer of sharing a twin room in a hotel, a "healthy breakfast and working lunch" and expenses didn't feature in this guidance as an adequate alternative to proper pay of at least £8.30 an hour. During the Labour leadership campaign Ed Miliband signed a pledge organised by the campaign Intern Aware promising that, if elected, he would "campaign for Labour’s Minimum Wage Act to be fully enforced so that employers must pay their interns what they are due". Somehow, I imagine the chances are slim at best that he'll speak up and demand that this includes the Olympics in 2012. Property investor Jamie Ritblat's company Delancey made a £50,000 donation to the Conservative Party just months before it bought the Olympic athletes' village in east London at a £275m loss to taxpayers. This is the first time Ritblat, Eton-educated son of property giant John Ritblat, or his firm had donated to the Tories, according to the Electoral Commission. 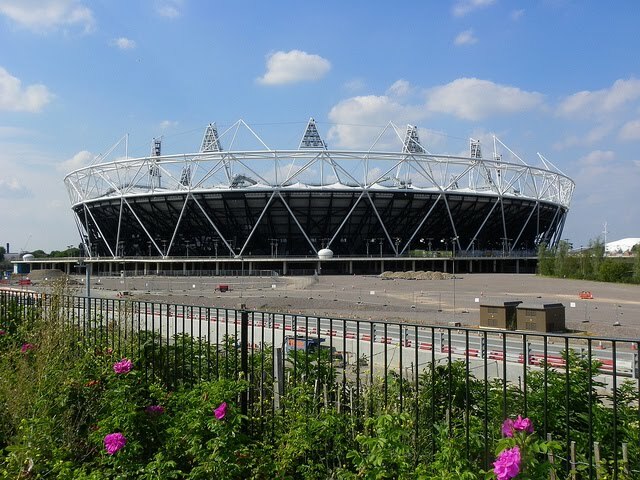 Delancey bought the Olympic Village with Qatari Diar, the Qatar investment vehicle, for £557m – nearly £300m less than the Olympic Delivery Authority had paid to build it. Other bidders had offered even less, so the dead at least represented the smallest loss to the public purse. The deal's supporters say that the Olympic homes, which have no kitchens, require a lot of remodelling before they can be rented or sold after the games. The Wellcome Foundation, which also bid, wanted a larger slice of the site and to build a research centre, which would have netted less money in the short term but potentially could have done more to create jobs and boost the economy. The strong possibility that the Delancey-Qatari owners may sell many of the properties to overseas buyers may also add controversy. Ritblat will have plenty of opportunities to discuss these issues with the government: £50,000 buys him a place at the Tory party's “leader's group” and the chance to rub shoulders with David Cameron and other party bigwigs. Though culture secretary Jeremy Hunt described the Stratford deal as “fantastic”, as it would “give taxpayers a great return”, Ritblat Jnr's ventures haven't always been so good for the public. Delancey was part of the notorious “Mapeley” consortium which bought all the UK's tax offices and leased them back to the UK government, with a lot of cash flowing offshore into a tax haven. There’s little doubt that Stratford library is always busy – it’s often difficult to find a seat amongst the students who use it regularly and its children’s area is popular with local parents. However, most may not know that the library is due to close for six months from 1 October for what Newham council calls “refurbishment” – and what in practice means the incorporation of the Local Service Centre, currently across the road near the Fox pub, are part of the Mayor's plan for "Integrated Front Offices". With no notice and no public consultation, this will involve a drastic reduction in the children's library area. According to my conversation with senior library management, the Borough’s communications team had not authorised them to inform library users of these impending changes. This is unacceptable and makes parents and children feel that they are victim to cynical machine politics. Parents and children of Newham will not be able to forgive politicians who stand back and allow a whole generation of young people to be betrayed in this way. Sadly this kind of secrecy is commonplace in Newham. As those of us with a long memory also know well, efforts to persuade Sir Robin to change his mind are notoriously difficult, especially when squeezing other council services into a smaller, more overcrowded Stratford Library enables him to continue to claim that no library in Newham will actually close. The campaign by parents therefore needs all the support it can get from local people. You can find out about how to do so here. Down in Docklands today, arms dealers gathered at the ExCel Centre to spend millions on arms, ammunition and equipment. Meanwhile, the new Stratford Westfield shopping mall also had its opening day and was mobbed by crowds reminiscent of the pre-Christmas rush on Oxford Street. Due to work commitments I was able to make it down to Custom House, where I hear that protests were smaller than in previous years. As for Westfield - as well as the 'smarter' shops, the mall also has its fair share of the usual chains, including Primark, Footlocker and Greggs. There's little doubt it will kill the old Stratford Shopping Centre, but will the crowds really return to Westfield in the same numbers once the novelty has worn off? The Metropolitan Police today applied to the Home Secretary for consent to lift a blanket ban on protest marches in four East London boroughs to allow a march against the world's largest arms fair to go ahead on Wednesday 14 September 2011, following a threat to bring legal proceedings challenging the lawfulness of the ban. Taherali Gulamhussein, a protestor and volunteer with the Network for Police Monitoring, last week instructed Kat Craig of Christian Khan Solicitors to send a Letter before Action challenging the 30-day blanket ban on protests imposed on all marches in five London boroughs, namely Tower Hamlets, Hackney, Islington, Waltham Forest, and Newham. The decision to vary the ban, which had been applied for by the Metropolitan Police under Section 13 of the Public Order Act 1986, came one minute before a deadline given by Mr Gulamhussein’s lawyers to cancel or vary the ban, or be taken to the High Court tomorrow (Tuesday) morning. The ban has now been lifted in all boroughs except Tower Hamlets. The ban, which came into force on 2 September 2011, was originally believed to have been put in place following concerns about a march planned by far-right group the English Defence League (EDL) in Tower Hamlets on 3 September 2011. However, activists and lawyers raised concerns when they noted that it extended far beyond the area where the EDL intended to march, and was due to be in force for a period of 30 days. In response to the threatened legal action, the Metropolitan Police disclosed that concerns about further public disorder following the shooting by police of Mark Duggan, whose funeral took place last Friday, were one of the reasons the ban was proposed. "It is deeply concerning that the police and the Home Secretary attempted to use the funeral of an innocent man, who died at the hands of state agents, to prevent legitimate protests taking place. Further, it makes no sense as the ban covered a completely different geographical area. This is yet another example of the lack of transparency we face when dealing with the police, and shows that we must challenge their decisions to ensure accountability." This Friday's lunchtime distraction is a anti-capitalist parody of the staggeringly awful Levi's advert playing in cinemas at the moment. It gets far closer to some real truths than the noodling jazz of the jeans ad. The judicial review of the Home Office's plans to amend the 133-year old law that protects Wanstead Flats and stands in the way of the proposed Olympics police base, will soon mean a weekday hearing at the Royal Courts of Justice in the Strand. As regular visitors to this blog will know, the 'Legislative Reform Order' amending the Epping Forest Act was passed with little debate by Parliament some months ago. However, the Save Wanstead Flats campaign has continued to argue that because the consultation carried out by the Home Office was so poor, denying local people a proper chance to challenge the decision, it should be overturned. One resident, Dr Michael Pelling, has therefore sought a judicial review of the Home Office consultation process, with the Save Wanstead Flats campaign named as an 'interested party'. At some point within the next eight weeks, a hearing date will be set and as soon as it is, the Save Wanstead Flats campaign plans to hold a protest outside of the court. Local residents will then be able go in and witness the hearing. A leaflet is circulating to homes locally asking if residents want to receive an update on the final court date. A copy can be downloaded from here [PDF]. 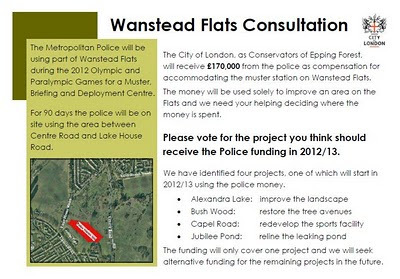 "In response to the comment posted earlier on a social networking site, the Met have not issued a compulsory purchase order for land at Wanstead Flats and have no intention to. As set out in the Met's planning application, the use of the fairground area of Wanstead Flats is for a temporary period of 90 days in the summer of 2012 and awaits the outcome of the judicial review process which is currently with the High Court. " As Mr Knight went on to suggest on FaceBook that the source of his claim is "Epping Forest HQ", I have contacted the Head of Open Spaces at the City of London Corporation asking for confirmation that no discussions about a compulsory purchase order have taken place. As soon as a reply comes through, I'll pass on the Corporation's comments too. I can confirm that, since the decision was taken to apply for a LRO, there has been no discussion with the Met about use of a Compulsory Purchase Order and we await the outcome of the judicial review process. So Tim Knight, whoever you are - where did you get your information from, eh? I'm guess I'm not the only one who gets irritated by adverts in front of YouTube videos. Today's Friday lunchtime distraction features Mario and Fafa from Glove and Boots discuss the finer points of YouTube advertising as they try to figure out how to make money their video blog. The battle to try and persuade Newham council to explain how it has actually spent hundreds of thousands of pounds allocated for its ‘Preventing Violent Extremism’ programme has been rumbling on since February 2010. In July this, as I reported at the time, a series of specific questions put to the senior officer responsible for PVE, following a meeting in May 2011, had still not been answered. But yesterday, after more than three months, a reply finally appeared: an eighty one word e-mail of more wilful obfuscation. Up until now, I haven't named the council officer who is stonewalling questions about the council's lack of openness, but considering how insulting and evasive his latest response has been, I feel it only right that I now do so. As council tax payers, we fund the salaries of senior officers after all and, as the campaigner Heather Broke points out in her book The Silent State, the ability of bureaucrats to hide behind anonymity often contributes to an even greater lack of transparency. So anyway... the official in this case is Geraint Evans and he is the 'Community Resilience Manager' within the Safer Newham Partnership Team. "As for the questions on budgets and spending, I would refer you to the Freedom of Information section on the Newham website, where similar questions have recently been answered". But sadly, they haven’t been answered. It is impossible to comprehend why these questions couldn’t just receive a straight answer, instead of requiring a trawl through pages and pages of the council’s FOI Disclosure logs. But I have searched through them – and the FOI requests on PVE budgets are my own and they did not answer the specific question on how huge sums of council money were actually spent. That was the point of asking for more detail in the first place – and Evans’ response is nothing short of utter nonsense. “I should also remind you that any questions regarding Channel should be put to the Police, rather than to LBN, as they are responsible for such things”. So despite insisting that Prevent doesn’t target the Muslim community, Evans now insists that Channel has nothing to do with him. How, then, can he claim to know? “LBN are currently working on a new delivery plan." You will note that there is no indication when the new plan might be ready or whether it would ever be made publicly available once it has been finalised. Neither is there what was asked for: not even an invitation to spend hours searching through the council's website for its current strategy document. It's hard to imagine how this reply could have been any more unhelpful. The only potentially useful information provided was a copy of an external assessment of the delivery of the PVE programme in Newham, conducted by the Office for Public Management (OPM). This report is interesting, for it raises serious questions about why Newham has such a huge PVE caseload, as many of those questioned by OPM felt that Muslim radicalisation in Newham “was nonexistent, limited or ‘moderate’ at worst”. I’ll cover the 108-page document in a further blog post soon.